Often PC users face the problem of finding the right information about the contents of the system unit – not all of them are installed driver. For instance, the model and the power system block in software is almost impossible. And this is very helpful information because when you add new devices to the configuration of the computer know the power supply is necessary. View the technical documentation of the computer where you have to register the configuration settings specifying the device models. Also, the specification may be separate for each piece of equipment. If you for some reason can't see the computer's documentation, use the alternative. Armed with a screwdriver or a screwdriver and Unscrew the bolts holding the housing side wall. Carefully inspect the contents of the system unit, locate the unit power. It is located on the right side on the rear wall of the housing in the form of a large box with radiating plumes. Carefully consider the unit of power, it must be stickers containing information about the manufacturer, model, basic parameters of the device. Usually these stickers glue so that users could easily read the information, but sometimes it also happens that they are placed on the bottom or top side. In this case disconnect all leads of the power from devices inside the computer, carefully pull them over the base, while making a preliminary sketch wiring diagrams of circuits of the power supply to the motherboard. Unscrew all fasteners that hold the unit 's power and remove it from the housing. Also try to find out information using a systematic approach, but it is not always effective. Download and install Aida or any other similar utility purposes. Open it, the system will collect information about your hardware configuration and give it to you after a certain amount of time. In fact, the driver unit power supply is not installed, so learn its parameters in this way would be almost impossible, but worth a try. Be careful when disassembling the computer, don't lose the fasteners. If the warranty on the computer did not work, do not open the system unit by yourself. If the computer does not turn on, the cause may be a burned-out block power. Of course, do not just go to the store and buy a new one. First, it is necessary to check the efficiency of the power supply. Perhaps the problem is not in it. Work computer, clip, screwdriver, multimeter. Take another working computer. Carefully disconnect the wires from the power supply and remove it. Connect the power supply to check. And try to start the computer. If it does not turn on, recheck the proper connection of all wires and start again. If the computer does not turn on again, then your power supply is burned. If you don't have another computer, remove the PSU and open it. Carefully inspect everything inside. If you see swollen capacitors, smelled or saw Gary spilled a sticky liquid on the motherboard, then your power supply is burned. If the inside no damage is detected, it is necessary to try to run the power supply separate from the computer. A large part of the power supplies are equipped with load resistors (the exception may be some Chinese models), so the hot wire and test the power supply to be safe. Put the PSU on the floor and check that under it there were no metal objects. Take the ribbon cable that connects to the motherboard, select the black and green wire. Lock usual a paper clip both wires. Instead of a paperclip you can use any metal object. If the power supply is switched on (earned cooler, turn on the led of the drive), so the problem is not in it. This is the easiest way to check power supply for proper operation. Next, you will need to check the voltage on all outputs of the PSU. It is of 3 types - +3.3 V (orange), +5V (red and white), +12V (yellow and blue). Better before testing, connect the power supply small loads, such as automotive light bulb. Take a multimeter and connect it alternately to each output. Before checking all the connectors better purging to remove accumulated dust. Slight variations in voltage are permissible. If deviations are more than 0.5 V, then the problem is in this place. If your PSU is still under warranty, do not open it yourself, otherwise the warranty will be invalid. If you have not worked with the current, it is better not to measure and not to hot wire it independently, and to give power supply to the service center. Total consumption power of the computer is the electricity that goes to power all its devices. To know it you need to choose the right power supply. Well, nice to see the costs always-on computer to the family budget. Consumed power of each device can be ascertained by checking its specifications on the manufacturer's website. One of the main consumers of electricity in the system unit processor. 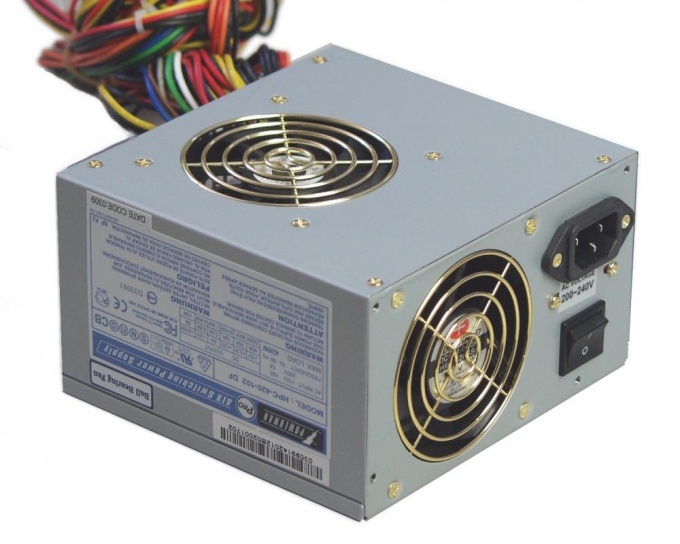 Its power consumption ranges from 45 W (Core 2 DUO E6300) to 135 watts (Pentium 640). It is necessary to take into account that overclocking increases this figure by approximately 25% for every 10% overclocking. Motherboard can consume 15 to 30 watts. In "device Manager" view, which integrated devices are contained on the motherboard of your computer: sound card, RAID devices, network adapters. They increase the power consumption. The video card requires from 50 to 130 watts. This figure fully depends on the performance of the video card and depending in what mode it works. Additional power increases the power consumption almost in 2 times. Heavy-duty – 3D graphics, high screen resolution, working with powerful graphic editors – also increase the power consumption. When calculating take into account the mode of operation of the adapter. Power required hard drive, depends mainly on its condition. Peak loads have to turn on, when you run diagnostics of the hard drive, searching for files when the heads are moved over the surface of the magnetic media, and copying large amounts of information. On average 15-60 watts. Consider what actions you often perform on your computer. Optical disc drives consume 10 to 25 watts. Most energy is consumed when high-speed recording, and when reading the low quality disc when a rotation speed is constantly changing. Very large power consume harvesters – devices that can write CD and read DVD. The power consumption of a sound card depends on the class. The higher the sound quality, the more power is required for its reproduction. The average sound card required 5 to 10 watts. Go to the website of the manufacturer to yield input power your sound card. The cooling fan requires 1-2 watts. Because in the modern system unit to them, as a rule, not less than two, multiply the average power by the number of the fan to calculate their total power. To know the energy consumption of your computer , you can online calculators. Go to the website and enter device data into the appropriate Windows. The program will calculate the power consumption of each component and the system as a whole. A faulty power supply leads to the breakdown of the entire computer. If the power supply does not turn on, the question of his health remains. Harder to determine if the power supply is not sending the right voltage according to one of the power wires. This can help ordinary tester. Remove the side cover of the system unit, which opens access to the motherboard. Disconnect all power leads from motherboard, graphics card, hard drive and so on. Leave connected the DVD drive — it drops voltage and a sudden shutdown is not as scary as the other components of the computer. Carefully unplug all wires, because you can harm the computer if misused. If you do not understand this, it is best to take the computer to a specialized center to check or to buy a new power supply. Take the loop of the main power to the motherboard and short it the connectors green and black using the usual bent paper clip. Turn on the tester and connect the power supply to the network. Turn on the power supply with a switch on its case. After starting the power supply (if it does not start, check the clip) insert the black test lead of the tester in any of the black power wire and the red probe alternately insert the other colored pins. Carefully follow the indications of the tester, as it is a very important operation when checking the health of the power supply. If the indicators deviate from the reference by more than one, it indicates that the power supply gives too high (or too low) voltage. Such a power supply can be considered faulty, it can be repaired. 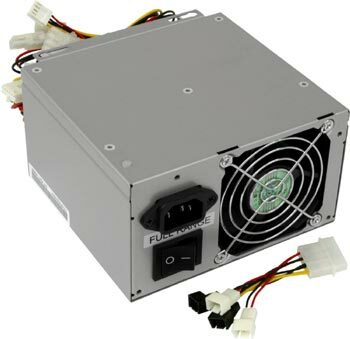 To repair the PSU in the service center on repair of equipment. 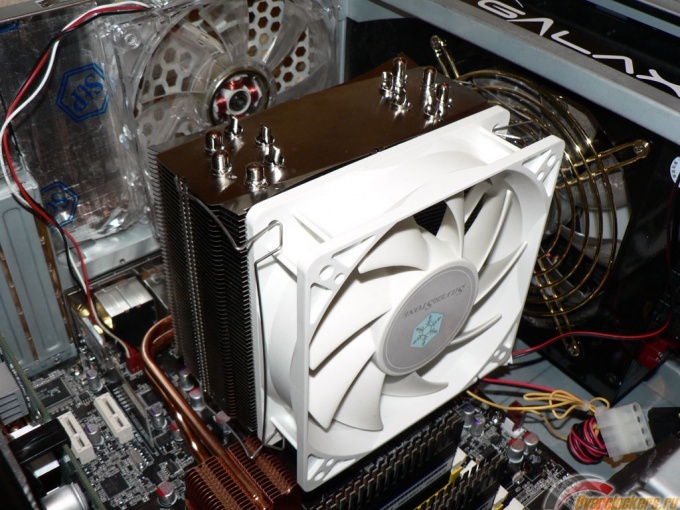 It is also worth noting that with the development of new components for personal computer requires a large power supply, so in some cases you need to purchase a new one that is more powerful. 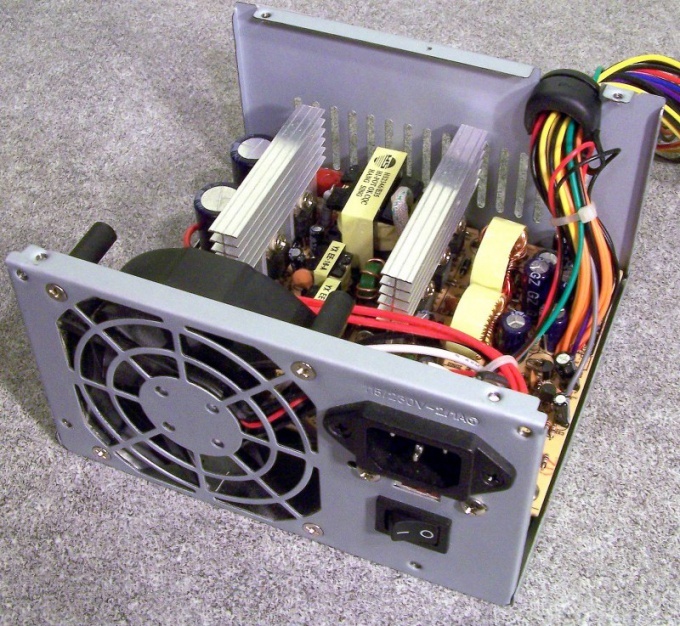 Power supply – a component of the system unitthat supplies voltage to all the basic elements of a computer: motherboard, drives, hard drive, and so on. It is the standard input power at 220V, which is then distributed to circuits and electronics. Do a quick check of the unit power supply without being connected to devices and equipment. Take it 20-pin connector, locate the green wire and jumper wire to any black. If the block began to spin the fan, generally means the power supply is operational. For more detailed check, use the following steps. Look on the unit label, which provides information on allowable values, load currents on the channels, usually it is located on the side wall. Next, check the voltage on each of the channels with a multimeter to determine the efficiency of the unit, but rather, some of its elements. Information on "ideal" indicators and possible tolerances can be found on the official website of the manufacturer. Plug the power supply in series with an ordinary incandescent lamp, to avoid "fireworks". Turn on the unit in the network measure relative to the common wire voltage at the ninth terminal of the connector of the motherboard. If all the readings correspond to the permitted values, connect the PSU directly. Turn on the unit. This lock 14 and 15, the socket of the motherboard. "Load" the block to measure and evaluate the performance of BP. You must submit a load on it, at least half the maximum current. In the case of the 250W unit, it will be 11 amps. The load use powerful wire resistors, for example, sew. But be careful, this load can become fatal for most of cheap blocks. Therefore, move the load to the lower limit value of the current. Consider also that the resistor power is dissipated. For the +12V power is approximately 20-25W. Choose load resistors of these considerations. Connect the load and measure the indications to perform a health check BP, if the values of the stress correspond to parameters of the plate, the unit is suitable for use.